The last time I made gnocchi was approximately 10 years ago. Well, that is not entirely accurate. The last time I made gnocchi was really about 2 years ago (this dish to be exact), but the last time I actually made the gnocchi myself, not just a dish containing store-bought gnocchi, was last decade. In that two-year-ago gnocchi post, I told the story of attempting gnocchi for the first time for Randy. It is one of his very favorite dishes in the world and, when you are newly dating someone and really excited about them, how can you not want to make one of their favorite things? I followed a recipe to the letter, made a huge mess in my kitchen, had gnocchi that did not behave as they were supposed to, and, once sampled, were about as light as lead. I decided I would never make them again. To tell you the truth, I’m not as crazy about these little potato pillows as my husband is. Maybe it is because when I go to an Italian restaurant, hoping for sublime pasta or a perfectly seasonal risotto – dishes that I disdain as unimaginative veg options in non-Italian restaurants – the only veg thing on the menu is gnocchi. In the fall, I can guarantee there is brown butter and sage in the dish and summer, maybe a light tomato sauce and basil. 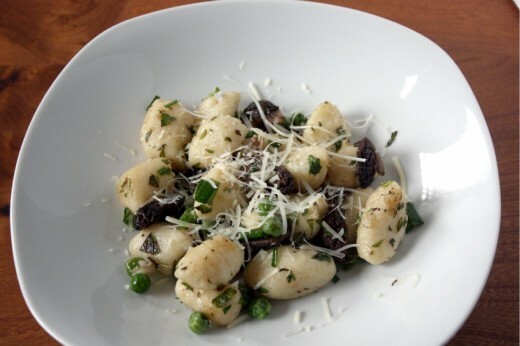 Often, even in the best restaurants, gnocchi are heavy, dough, starchy – not what I want to eat for dinner. I know, someone cue the small violins - poor me! So even though gnocchi are not my favorite thing to eat, I decided to take a class offered by the master. I love my husband and appreciate his willingness to eat vegetarian at home and to raise our boys vegetarian, it is the least I could do. Ethan Stowell is a local restauranteur who I wrote about here and who, it just so happens, is featured in the July issue of Food & Wine. The class was at a local grocery store, nothing fancy, but he managed to turn out one incredible dish after another in a 2½ hour time period. We learned how to make gnocchi with potato, with ricotta, and with semolina. I liked the ricotta version the best, both the actual gnocchi and the preparation, but I know my dear husband is all about potato gnocchi. And so that is what I made. As for preparation, you can’t go wrong with morels and peas. There are a few advantages to living in our climate and one of them is the mushrooms. We get the most amazing morel mushrooms this time of year although, until recently and because of record amounts of rain, they were $50/pound. I got them at the farmers’ market last weekend for the bargain price of $22/pound but thankfully they are light and you don’t need many for incredible flavor. If morels aren’t available in your part of the world, shiitakes would be delicious instead. I would use more of them, maybe closer to ¾ of a pound and just slice them in half. I would not have put oregano and mint together but it is a great combination. Preheat the oven to 400ºF. Prick the potatoes all over with a sharp knife and sprinkle them generously with salt. Place in the oven directly on the rack and bake until tender, about 1 hour. Allow to cool slightly, just enough to handle. Lay a sheet of parchment paper on a sheet pan. Put the potatoes through a ricer, letting them fall onto the parchment and discarding the skins. Spread the potatoes out on the parchment and allow them to rest until warm, but not hot enough to cook the eggs. Gather up the parchment and dump the potatoes into medium-size bowl. Add the egg yolks to the potatoes and stir to combine. Sprinkle the flour over the top of the mixture and knead gently in the bowl until the egg and flour are distributed. Turn the dough out onto a floured board and continue to knead, adding extra flour as necessary, until the dough is no longer sticky. Divide the dough into quarters. Very gently roll each quarter into a log about 1-inch in diameter (or smaller, if you like), then cut crosswise into 1-inch squares. 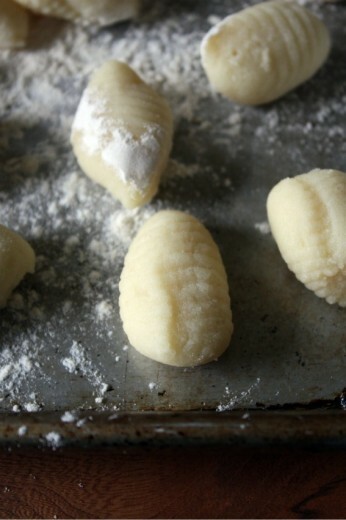 To create ridges, either use a gnocchi paddle or roll each square over the tines of a fork. Move the squares cut corner to cut corner. 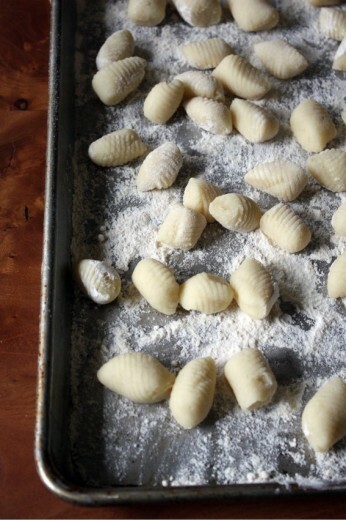 Allow each gnocchi to fall onto a well-floured sheet pan as you finish. If you use a fork, invert the fork so that the tines point down. Start at the tines nearest the handle, and roll the dumpling firmly but gently down the tines. You can hold the gnocchi on a sheet pan, as long as they are not touching, for a few hours. Or, you can blanch them which allows you to hold them up to one day in the refrigerator. Bring a large pot of water to a boil. Melt the butter in a large sauté pan. Add the morels and sauté until tender and starting to turn brown, about 5 minutes. Add the peas and fresh herbs and turn the heat to medium-low. Season with kosher salt and pepper to taste. Add the gnocchi to the boiling water and as they are ready, scoop them directly into the pan with the vegetables. I made this dish fairly dry, but you can make it saucier by adding some white wine to the pan. Garnish each portion with a sprinkling of Parmesan cheese, a drizzle of olive oil, and light pinch of truffle salt. I have never made them because they sound like they are a lot of work. They look so yummy and they are well done. Those gnocchi looks wonderful. I would like to invite you to our “Quick and easy recipe mela” and enter your recipe. We would be glad to see your participation. Thanks. I have made potato gnocchi exactly once, as well. And it took me eight hours. EIGHT. I said never again. And now you’ve convinced into “maybe once more”. Gnocchi is my absolute favorite meal. Yours look perfect! I love the morels in there too. So lucky! I’ve made gnocchi exactly once, and I had feared it forever. Love the tips for not adding salt and rolling cut end to cut end. When I work up the courage to make them again, I’ll remember those. Yours look fantastic with the morels and peas. 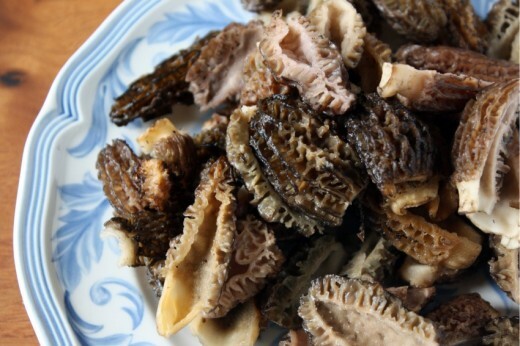 So jealous your farmers’ market has morels!